Looking for a venue to host a birthday, engagement, baby showers parties, business conferences and wedding reception. Contact Chandni Lounge! A beautiful venue with great atmosphere and in house catering by the finest chef. we cater for all your needs. FULLY LICENSED BAR and free parking available on site from 2pm daily. Want to party a little later? No problem we have facilities for Looking for a venue to host a birthday, engagement, baby showers parties, business conferences and wedding reception. Contact Chandni Lounge! A beautiful venue with great atmosphere and in house catering by the finest chef. we cater for all your needs. FULLY LICENSED BAR and free parking available on site from 2pm daily. Want to party a little later? No problem we have a late licence! A beautiful venue with great atmosphere and in house catering by the finest chef. we cater for all your needs. Let us know how we can make your vision a reality! Chandni Lounge would love to be a part of your special day contact us today! We are open to venue viewings to fit around your daily schedule. Availability: We are available to hire and host your functions seven days a week. Hire Costs: Please contact us for all our prices and bespoke packages to help cater to your day. There have been 0 reviews of Chandni Lounge Bespoke Banqueting. If you would like to send Chandni Lounge Bespoke Banqueting a booking enquiry, please fill in the form below and click 'send'. 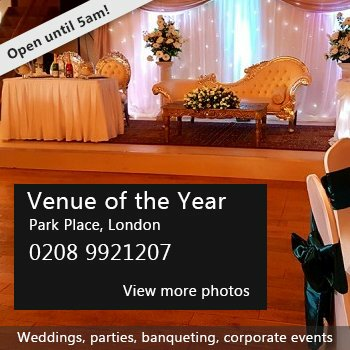 Perhaps some of the following halls within 5 miles of Chandni Lounge Bespoke Banqueting would also be of interest?